As a lark, last spring I created an interactive map of all of the anthropology departments in the world. This map makes use of Google Maps and their API. 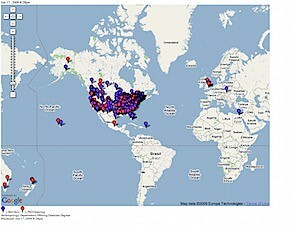 You can view the AnthroMap here: http://mendel.cla.csulb.edu/anthromap/ The main page looks something like this. There are two kinds of departments shown: Departments with PhD programs (Red) and those with just M.A. Programs (blue). Click on an icon will show you the Department URL, the University URL, and a list of faculty who teach in that Department (accurate up to June 2009). When possible it lists the email addresses of each of the faculty. You can also do a citation analysis for the departments. On the pop up window, you can click on "Citation Analyses." This runs a query through Google Scholar for each of the faculty and sums up the number of citations for each published article for which the individual was an author. The data are displayed in bar chart form to allow comparisons. The window also has a list of each of the faculty that links to the articles and the raw citation data. Note that you might get a baffling HTTP Error 503. As far as I can tell, there are some limits placed on the application as to how often it can query Google Scholar. I suppose I could make this a 'canned search' running every day, but it would take more coding and I'm lazy. If you get this error and know how to fix it, let me know. If not, wait a while and try again. Someday I'll figure it out. 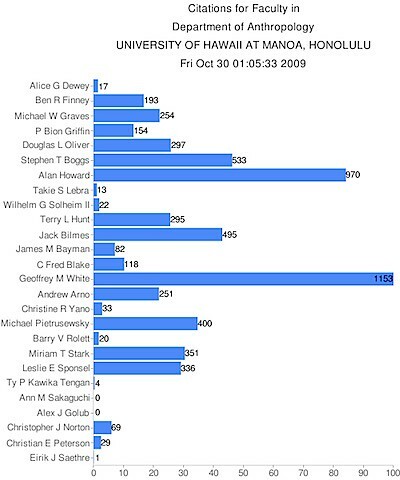 For an example, here is a graph of the citations for the Department of Anthropology at the University of Hawai'i, Manoa. If you are looking for references to CSULB's department (and you know who you are... Nancy) you can try this link or possibly this one. Draw your own conclusions about impact to the discipline, productivity and contributions to the University. May be your browser - Im using Google Chrome and Internet Exploder 7. Not sure about other variants. I am using a CSULB Computer and it is IE7 so maybe it is boken on your side. If science were a band, it would be TMBG. Enhancing archaeological training with iTunes U.